CSSUtilities can find all the rules that apply to an element, including information about properties, media, specificity and inheritance. It can give you properties information that bypasses browser normalization, so you get values such as colours and dimensions in the original unit they were specified with, rather than the normalized or computed values returned by built-in query methods. It can tell you which properties apply directly, or which through inheritance, and can identify rules and properties that have been cancelled out by others with a higher specificity, as well as those which only apply to dynamic states like :hover. It can tell you the media for any rule, both the types that were originally specified and the computed values that ultimately apply. It can tell you the specificity of any selector. CSSUtilities supports both the W3C standard DOM CSS implemented in Firefox, Opera, and the Webkit browsers, and Internet Explorer's proprietary setup from IE6 onwards. 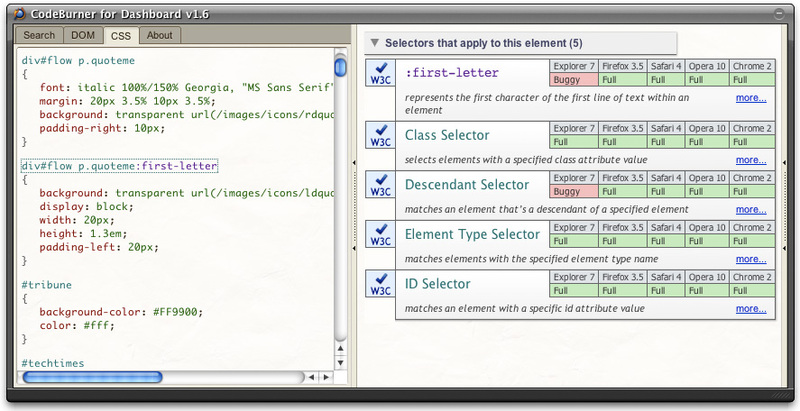 CSSUtilities understands almost everything from CSS1, CSS2.1 and CSS3, and supports all forms of stylesheet include. It works in HTML, XHTML and XML, and can equally handle physical or virtual DOMs. CSSUtilties provides CSS inspection capabilities that are more accurate and detailed even than those provided by Firebug! (Seriously!) And it makes these capabilities available to ordinary, unprivileged code that runs in any contemporary browser. You can see CSSUtilities in action in the wild, by grabbing a version of CodeBurner for Opera, Dashboard or AIR, where it powers the entire CSS inspection interface. Any rules which apply to the element you select will be shown in the output area. You can also hover over each rule to see additional information in its tooltip. But this is just a small sample of the full range of data available from CSSUtilities, and just one example of how it might be organised. I recommend checking out some more demos, and familiarising yourself with the Developer’s Guide provided, to give you a fuller sense of the script's capabilities. For more about design patterns see :: Getting data. Download the zipfile [370K] and unzip it into your site directory; then the Setting it up guide will show you what to do next. The archive also includes a selection of demos, that illustrate how to use the script, and demonstrate some sample output. More generally, it should work fully in any environment that supports DOM2 CSS and XMLHttpRequest (for example, it all works fine within the Adobe AIR runtime, which uses a version of Webkit). for details of the library's CSS support see :: General specifications.